Contribute to the construction management and construction project management bodies of knowledge. The organisers aim to bring together researchers, academics, administrators and practitioners representing educational institutions, government agencies, contracting organisations, consulting enterprises, financial institutions, and other construction related organisations from all over the world. What changes would lead to an improvement in performance? How can information technology contribute to improved performance? 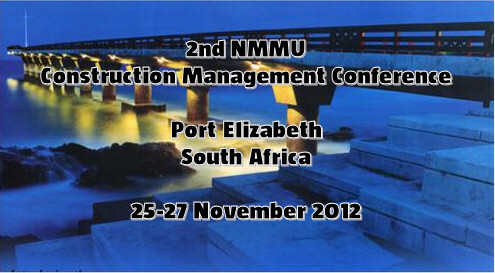 How can construction management be promoted in the informal construction sector and among SMMEs? How can education, training, and professional development be improved? How can skills better be developed and transferred? How can communication and management difficulties be addressed? How can risk be better recognised, understood and avoided? How can corruption be mitigated? How can ethical behaviour be promoted? How can diversity and inclusivity be promoted? How can the regulatory environment be more effective? How can professional association and registration be promoted?